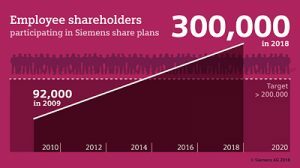 Today is “Share Day” in Germany, and Siemens is marking the occasion by highlighting its firmly anchored ownership culture: some 300,000 of the company’s 379,000 employees worldwide are also Siemens shareholders. This means that nearly 80 percent of all Siemens employees are simultaneously co-owners of their company. 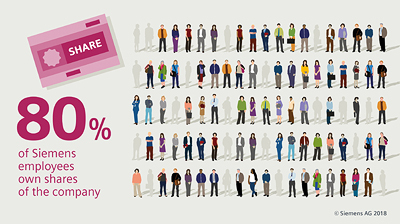 The number of employee shareholders at Siemens has remained constant since last year. No comparable company can point to such a high number of employee shareholders. 80 Prozent aller Siemens-Mitarbeiter sind nun auch Siemens-Aktionäre. This year, as part of its global Share Matching Program for employees, Siemens awarded a total of around 702,300 free shares worth nearly €68 million to employees in 65 countries. After a three-year holding period, participating employee shareholders receive one matching share at no additional expense for every three shares purchased as part of the program. The company and its employees donated a total of nearly €223,000 through Cents4Sense. These funds are flowing into various social projects sponsored by the Siemens Stiftung to support the United Nation’s sustainability goals: “The Cents4Sense donations are, among other things, enabling us to train school teachers in Argentina, Peru and Nigeria to provide modern classroom instruction in science and technology. This enhances students’ problem-solving abilities and creativity, thus sharpening skills they’ll need to succeed in the 21st century,” explained Nathalie von Siemens, a Managing Director at the Siemens Stiftung. In addition, the donations are being used to support social entrepreneurship projects for supplying water and providing healthcare in the Philippines, India and Kenya. Share ownership is and will remain a key aspect of Siemens’ ownership culture, which aims to encourage every employee to take personal responsibility for his or her actions at the company. This approach is based on the conviction that employees have a stronger personal identification with their company if they own a part of it. Employee co-owners are more motivated and committed, assume responsibility and act in a way that supports their company’s long-term success. Ownership culture remains an important aspect at Siemens’ subsidiaries, too. This is the case, for example, at Siemens Healthineers, where eligible employees can participate in separate equity programs for Siemens Healthineers AG. Ownership culture has a long tradition at Siemens: the company introduced its first employee profit-sharing program back in 1858. Siemens’ global Share Matching Program was launched in 2008 as the core of the company’s Equity Culture. Today, it is one of the world’s largest employee equity programs. Currently, more than 290,000 Siemens employees in 60 countries can participate in the program.